Throw away excess dressing. 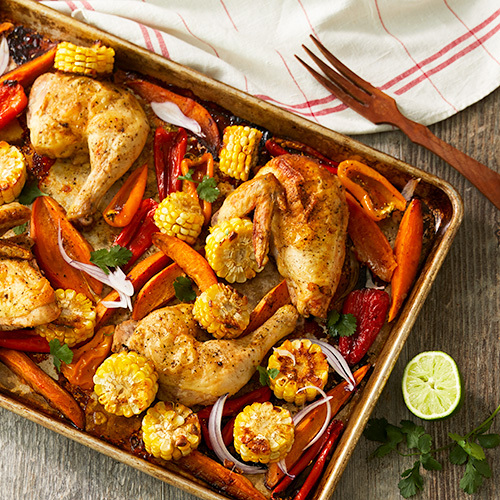 Place chicken on a greased sheet pan. Season generously with salt and pepper. Toss corn, peppers and potatoes with enough olive oil to lightly coat. Season with salt and pepper. Arrange vegetables on baking sheet between pieces of chicken. Bake 40-50 minutes until the chicken is golden brown and has an internal temperature of 165° F and the vegetables are tender and slightly crisp (these may be turned over half way through cook time). Remove from oven and allow to rest for 10 minutes. Top with red onion and fresh cilantro. Squeeze lime juice over the chicken and vegetables before serving.